It was a harrowing scene on one of the runways at the San Francisco International Airport (SFO) early Saturday morning as a Boeing 777, part of airline company Asiana Airlines, skipped across the tarmac upon landing. First responders rushed to the scene, hoping to assist those who were still on the plane. Several emergency slides were deployed from the plane as passengers rushed to exit as the plane began to fill with smoke. Through data collected from the jet’s black boxes, we are beginning to have a clearer picture of what may have gone wrong. The National Transportation Safety Board (NTSB) has revealed brief timeline of the final seconds before the crash. •	Seven seconds before the impact, one of the flight crew members called to increase the plane’s speed, perhaps realizing the aircraft was travelling at too slow of a speed for a safe landing. Witnesses and passengers have stated they believe the pilot may have tried in increase the speed of the aircraft, albeit too late, as the nose of the plane was angled higher than usual. The plane skidded along the tarmac about 2,000 feet and caught on fire before coming to a stop on the grass. Though not officially reported or confirmed, many are pointing to pilot error as the cause of the crash, especially after the president of Asiana Airlines ruled out a mechanical failure. Indeed the Boeing 777 has a strong safety record and has a nearly unblemished record with no fatalities and no indication was given from the cockpit to the control tower that anything was wrong. Additionally, it has been repeatedly reported that the pilot, Lee Kang-kook, had never before landed a 777 at SFO, and had only 43 hours on the jet, though he had significant time on other aircrafts. In accord with world standards, Lee was flying with an experienced Boeing 777 pilot at the time. 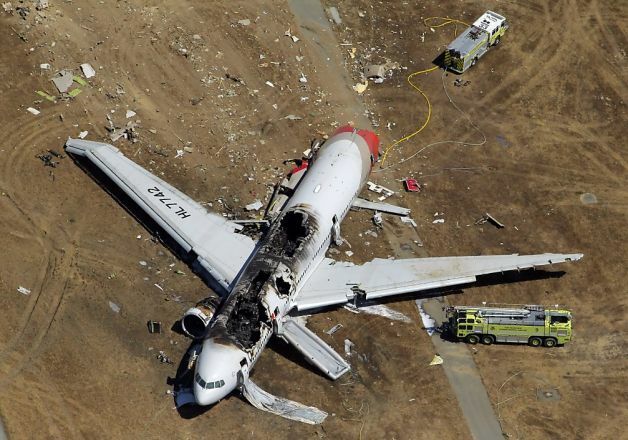 Of the 307 passengers and crewmembers on the aircraft, were killed and another 181 injured, many in critical condition. Remarkably 123 people walked away unharmed. The two who passed away were middle schools students of an eastern Zhejiang province in China, in the U.S. as part of a summer study abroad program. Injuries included several spinal fractures, head trauma, and abdominal injuries. Many were also experiencing a gruesome rash all over their bodies consistent with being dragged, reported the chief of surgery at San Francisco General Hospital. National Transportation Safety Board Chairman, Deborah Hersman, has not reported the plane’s speed on impact but has said it was significantly below the 137 knots required for the approach. She also stated that it would take weeks, perhaps months, before they are able to reach a conclusion on what caused the crash and are hoping to be able to interview the crew members within the next few days. No doubt, different agencies will be investigating the crash extensively to figure out what exactly went wrong and if it could have been prevented. For those who suffered injuries from the crash, the first priority will undoubtedly be their health and recovery. When the investigation is complete, questions will begin on what rights the passengers have for compensation. If the airline is found to be negligent, most passengers who were severely injured would be eligible for a $300,000 payment under the Montreal Convention. However, the fairness of this payment may be questioned. Aviation accidents are certainly rarer than automobile injuries but are often deadlier and more dangerous. If you have been involved in an aviation accident, call today for a consultation with the Brod Law Firm. Attorney Gregory Brod is experienced and ready to help you.